Was cleaning the exterior of the radiator and ac condenser with soap and water while in the car. Had the air filter system off. When finished I started the car. The AC was on so the fan came on and blew some water mist over the engine. Car started throwing codes and I noticed I had the air filter off so I shut it off and installed. 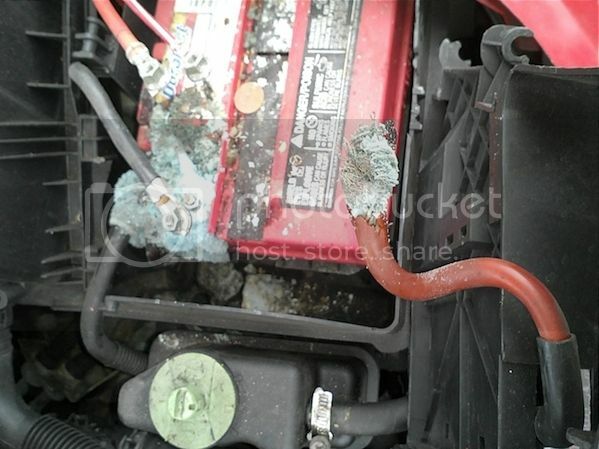 Car would not start after. Would not turnover. All of the electrical stuff was acting funny, lights dimming, clicking noises etc. Hooked up jumper cables and after a while it started. Ran for a while and turned the AC on. Heard a loud click and engine died. Jumped again. Ran for a while and shut off and restarted several times without issue. Tried AC. Wouldn't come on. Some of the heater controls wouldn't work either. Couldn't adjust fan speed or temp control. Could adjust setting for vent or defrost etc. Slowly everything started working and AC came on and I could adjust all controls. Everything looked good. Volt meter on dash showed to be charging. Turned off engine and tried restart. Back to not starting and making clicking noises. Could a battery do this? Could I have shorted something when the engine got misted with water? It wasn't alot. Could my ECM be taking a dump on me? Before this the electric locks were acting funny. If I locked the door from the electric lock and then closed the door it would unlock and occasionally when I started the car or turned it off they would click a few times. If you have a hand held digital volt meter i have tests for you. I am on my cell right now will post some info tonight. Did the air flow meter get plugged back in. How much water sprayed on the optispark or into the vacuum hoses that pull fresh filtered air in and ozone that was created by the spark jumping from the tip of the rotor to the cap terminals. Cranking the engine is separate from much of the computer functions ,but not all. So does the starter motor turn the engine at a proper cranking speed ? Yes or no. Got a timing light to clamp over coil to cap wire to check spark. Clicking while attempting to crank the engine Requires cleaning the battery cables first. Check with the battery terminal bolts removed from the cable ends. Use hot water and the stainless steel wire toothbrushes to clean with. To be clear the clicking was coming form inside the interior with key in on position, not while trying to start. The battery terminals look really good but I will pull them off to check and clean. The air flow meter got plugged in. Hard to say how much water but it was just residual from washing radiator so I wouldn't think too much. My optispark was replaced with an MSD unit if that matters any about the water. The car fired right up as always right after washing radiator just was running rough(assumed because air filter assembly was off) and throwing service codes. After shutting down and trying to restart it acted like a dead battery. Dim interior lights, headlights wouldnt come on etc. But also the digital readouts on the dash were going dim and then getting brighter and the weird clicking noises. Then after a few minutes jumping it fired right up. Had alot of interference noise coming form speakers and after a few minutes that went away. Turned it off and fired it up several times with no issues. Then AC and Heat control issues for a few minutes and then that lined out. Car was running good and everything working. Turned off and tried to restart. Back to square one. It's like something is shorting or going to ground to be switching back and forth like that. It works and then doesn't. I will tinker with it more tonight or tommorrow and try to be more detailed. Hard to describe exactly what it's doing by typing but I know how to test the battery so I will do that as well. Thanks. There is a vats relay to interupt the starter crank signal and tha is probably grounded to the body.try to find ground cable to body near battery Tray. Perhaps a stud with a bunch of wires . I will look for it tonight. Thanks Wayne. Take some pictures around the firewall and battery tray and follow the wires . i don't have any good photos of a late C4 to post in the battery cable area..
run the voltage drop test first.. it will usually tell you where the BASIC issues are..
the voltage drop test can be used also on both sides of each connection point..
if you get any voltage reading from the ring terminal or wire to the part its attached to... then you have an issue that needs to be serviced..
be sure to examine the ignition coil for signs of high voltage leaks..
one tech kept a spray bottle of salt water to test coils with.. along with a bottle of distilled water..
spray some salt water on the coil and the engine would die.. spray the salt water off with distilled water and the engine would start and run again is a sure test of coil high voltage leaks.. salt water is conductive. took that leak straight to ground instead of making it jump to get there..
coils are only a few minutes to replace on these... and are a known failure issue. a bunch of years ago... an LT1 powered camaro came into the shop i worked at with a misfire.. i told my boss to change the coil first.. as i could see high voltage leak indications.. nope.. he wanted to change the optispark cap and rotor.. then he did the spark plugs and wires.. and still the car misfired..
i walked over and swapped on the new coil that i always kept on the top of my tool box as i did a lot of them on other GM cars and trucks with TBI fuel injection.. and it ran perfect..
he was a VW air cooled german factory trained tech with over 40 years of line experience. i only had 25 years of experience at that point in my carrier at that point.. a days work.. or 10 minutes work .. your choice of which part to change first.. It was a slightly loose ground connection at battery. Someone had an aftermarket post installed with a stud on each end. One goes in battery and holds cable and other end for accessories. Post was tight. Cable was not quite tight. Post stud was too long and bottoming out in battery keeping the cable from being quite tight enough. Needed a couple of washers.Positive cable is same way. Need to do it when I get a chance. Thanks for the responses. that should have been picked up in the voltage drop test..
test 1 should have been low..
test 3 would have been above 0.02 volts..
test 4 for surely would have been up around 4 or 5 volts..
i know that you probably won't get this.. but its true..
so the battery has 12.65 volts... when cranking it may drop to 12.2 volts..
but it the cable is LOOSE.. there will be 12.65 on the post.. and variable voltage on the cable... as the contact is made and broken..
this would show up as volt reading above 0.04..
you can grind some of the length off the stud..
please remove the studs and check for corrosion down inside the battery terminals..